One of many murals by artist Ginger Taylor at Broadway Shopping Centre, Sydney. Credit: Art Pharmacy Consulting/Jodie Barker. Art Pharmacy Consulting was contacted by longtime clients, Mirvac, to continue and expand the success of their long term local arts strategy, at their Broadway Shopping Centre in Sydney. 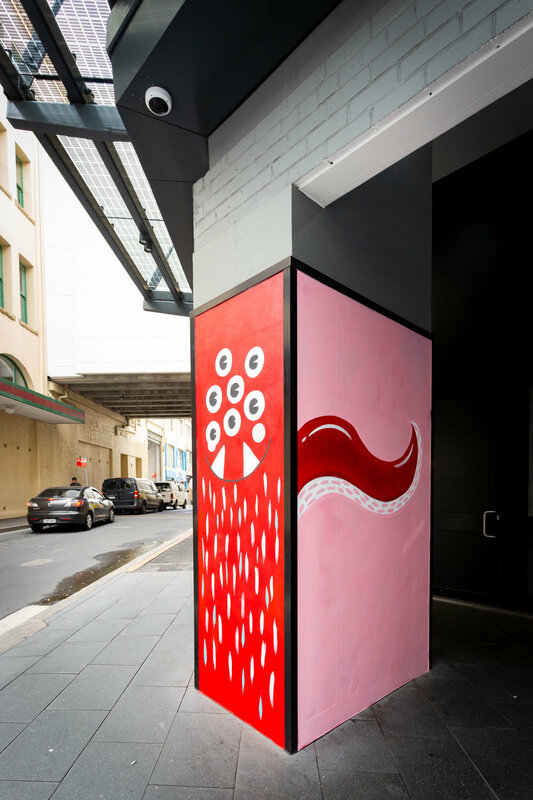 Art Pharmacy Consulting had previously helped them with a range of projects, not only at Broadway, but in centres across both Sydney and Melbourne. The client proposed a project that would channel the art of the whimsical and surprising street artists of New York City that transform the ordinary into extraordinary, by interpreting and embracing our urban landscape adding some humour and fun. This was to be a long term marketing project, reimagining two of Mirvac’s urban retail spaces, Broadway Shopping Centre and the Tramsheds. We were also asked to register the project with Art Month Sydney. One of many yarn bombs by artist Alison Thompson at Broadway Shopping Centre, Sydney. Credit: Art Pharmacy Consulting/Jodie Barker. Art Pharmacy Consulting came forward to the client with a range of local artists that would fit this brief. Over a period of six months, Art Pharmacy Consulting worked alongside the client to refine the scope of the project, identify the locations, and confirm a budget. In January the project was approved, and the client chose two Sydney based artists out of the proposed line up. Ginger Taylor would create murals living in the urban landscape, full of colour and fun, and Alison Thompson would be implementing her signature yarn bombing style to wrap parts of Broadway Shopping Centre in bright crochet. Art Pharmacy are no strangers to the phenomenon of yarn bombing. In 2016, we facilitated yarn bombing workshops with Optus for their employees at the Optus ‘campus’ in Macquarie Park. For Broadway, the concepts of the artists needed to be approved by the client, and Art Pharmacy Consulting were to ensure that all artworks met council regulations. Implementation took place over a period of two days in March, with Ginger Taylor and Alison Thompson installing the artworks onsite. The colourful pieces were installed alongside the rainbow escalators painted in celebration of Sydney’s Mardi Gras. The process was documented by photographer Jodie Barker. Videographer Jamie Humphris from Mountain High, was also on site, shooting video and short interviews with the artists. The finished result was several murals and yarn bombing activations in and around the Bay Street entrance of Broadway Shopping Centre. Ginger Taylor’s murals interact with, and interpret, the local urban landscape, turning pillars, pipes, walls, and air ducts into a vast array of cute and bubbly monsters and creatures. Alison Thompson’s crocheted pieces covered electrical poles, and turned bike racks into colourful rainbows springing from chalk coloured clouds on the ground.